I have to confess: as a Toronto wedding photographer I have documented many special events but there was none that came so close to the sophistication of this one. Truth be told, the brides and grooms who are getting married at Château Le Parc are part of the Torontonian elite. Among the guests invited to this big day I can list successful business owners and personalities. On a smaller scale, this wedding day was not unlike a Royal marriage. You also want to know that tying the knot at this wedding venue will set you back about $70,000. While it is not my business how much the bride and groom budgeted for their big day, the quality of the services at this venue was impeccable. From the delicious food to the entertainment, everything was flawless. Just take a look at the pictures taken during the wedding ceremony and those of the event space and you will realize this place is magical. 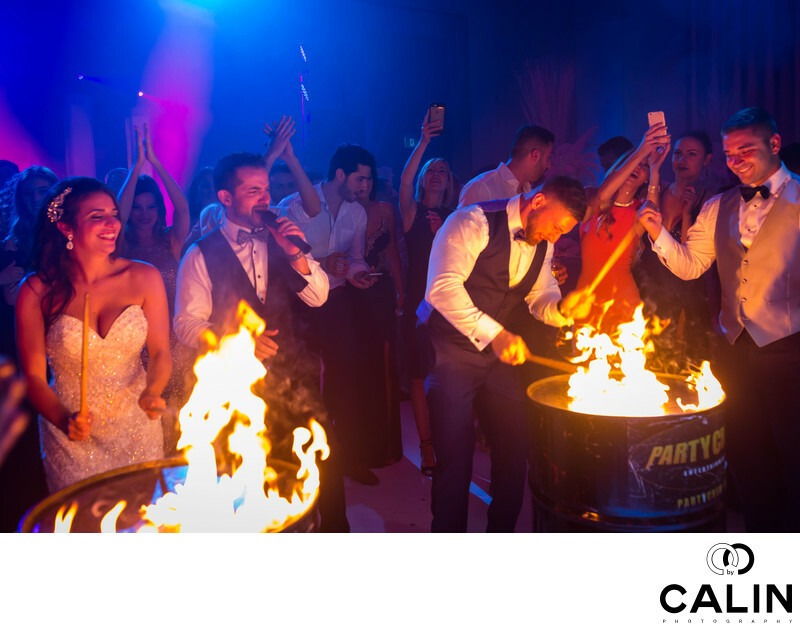 In this perfect wedding photograph we can see the bride and groom enjoying themselves while there beating two drums that were set on fire by the entertainers. The combination of the colours, music and fire, doubled by strong emotions makes this a phenomenal image worthy of the most prestigious awards. The composition is dynamic is a shot at an angle so that the bride and groom are position alongside the baroque diagonal. The image features complementary colours and everybody's looking at the bride and groom performing which emphasizes their dominant role in the frame. Finally, the lighting in this picture is splendid with the bride and groom being illuminated by the fire while a blue light washes them from a series of reflectors placed in the background. The most challenging part of creating this image was first capturing it. Once the bride and groom started beating the drums, everybody gathered around them and we had to make our way in to the crowd to be able to document this moment. In post production, it was very difficult to set a proper white balance because the combination of orange blue and violet lights made setting the white balance almost impossible.